The Baby Jogger City Mini scored well in our standard stroller review and is one we think is a good budget-friendly stroller, but we are not big fans of this product as a stroller car seat combination. Because this option requires the use of a secondary strap to secure the seat to the stroller frame, we feel it isn't the best choice. While the car seats feel connected, we worry that the extra step will go undone by parents who are in a hurry, forget, or feel the click connection works well alone. Forgetting the strap could lead to potential injury using the product in a way that is not how the manufacturer describes or recommends. While not that impressive when used in conjunction with an infant car seat, the City Mini did win awards in our Best Full-size Strollers and Best Umbrella Strollers reviews. The Baby Jogger company was founded in 1984 by parents who wanted to jog with their babies but couldn't locate jogging specific strollers. Necessity being the mother of invention, these parents decided to create the first jogging stroller. Baby Jogger has created different kinds of strollers from the get-go to fill the niche for various activities. It is important to note that the majority of Baby Jogger strollers are not suitable for jogging. The Baby Jogger company was recently purchased by Newell Rubbermaid and together they continue to create popular strollers. The Baby Jogger City Mini is a simple stroller that won awards in other stroller reviews. This chart provides a comparison of the overall scores for the combinations we tested in this review. The new City Mini (blue) improved over the previous version. The following information includes details on how the City Mini performed compared to the competition during testing. Attaching a car seat to the City Mini is easier than some but not the best in the group which hurt its overall score in this review. The City Mini earned a 6 of 10 for ease of attaching a car seat. This might be one of the most versatile car seat stroller combinations outside of the somewhat universal Baby Trend Snap-N-Go Ex. This product works with almost every major brand name car seat including Britax/BOB, Chicco, Cybex, Graco, Maxi-Cosi, Nuna, and Peg Perego. All require the purchase of a car seat adapter, and most need the canopy removed, but the primary seat can stay attached. The adapters we purchased worked with the Chicco Keyfit 30, Cybex Aton 2, Maxi-Cosi Mico, and the Peg Perego Primo Viaggio 4-35. Both the Peg Perego and the Chicco adapters are the loop style and they required assembly. Some of the testers felt the assembly was a pain, but given that you only need to do it once and there are no tools required, we think it is manageable for most parents. The others were all click in adapters that slide into connection points on either side of the toddler seat. The Chicco adapter attaches to the frame of the City Mini and the car seat carrier connects inside the loop. The second step of strap attachment is not our favorite design and we worry parents will skip this step. The seats are very similar in how they attach to their adapters, but the Chicco Keyfit 30 is the easiest with no additional pressure required to click into the loop. Aligning the side attachment points for the Cybex carrier onto the adapter for the City Mini can be more difficult than resting a carrier into a loop. The car seats that connect using side adapters were more complicated because the sides need to line up at the same time before pushing the seat to connect. The most difficult to install during our testing was the Maxi-Cosi, which we had trouble lining up correctly and often only one side would connect. Alternatively, the Peg Perego Primo Viaggio 4-35 carrier managed to feel installed and we even heard the audible click, but we were able to pull the carrier off the frame with a tug on the handle. All of the car seats have a strap step to complete the connection no matter what kind of adapter they have. Buckling the straps isn't difficult, but we worry some parents will skip this part feeling the click is sufficient. However, given our experience during testing, the strap is not only a requirement but mandatory to ensure a secure connection every time. In short, the additional step of securing the straps make this a stroller we don't think is the best for a car seat/stroller combination. The City Mini earned a 7 of 10 for weight and folded size, which is an increase of 2 points over the previous version thanks to a smaller folded size of 8,300 cubic inches. For a smaller stroller, the City Mini is surprisingly heavy. We feel an important feature of a stroller used with an infant car seat is that it be relatively lightweight and easy to fold, so new moms will be able to manage it on their own. This stroller is over 18.4 lbs without the canopy or car seat attachments, which is fairly heavy and an increase over the previous version. The smallest folded option is the Britax B-Agile 3 Combo, which is only 6,414 cubic inches. The City Mini earned a 7 of 10 for maneuverability, tying with the Doona, Bugaboo Bee3 and the UPPAbaby Vista Combo. Pushing this stroller is relatively easy and can often be accomplished with one hand. It is better on hard surfaces than rough ones, fits easily through narrow doorways, and generally gets the job the done without too many problems.For greater detail on the maneuverability of the City Mini, please read our review in our full-size stroller comparison. The City Mini has a stationary handlebar that is covered in a ridged rubber material that feels good when you hold it. While an adjustable handlebar would be nice, this bar is a good height for most parents. The handlebar is not adjustable but is at a pretty good height for most users. It is wrapped in a rubber material with ridges for grip-ability. The cover seems more durable than the foam covered bars and might hold up better over time. The City Mini has a pocket on the back of the seat. This pocket can be handy but can be harder to use with an infant carrier in place. The City Mini earned a 4 of 10 for ease of use. The Mini had difficulty keeping up with the competition. Ease of use impacts your everyday experience when using a stroller. A lower ease of use score indicates you may find is frustrating during regular use as a car seat stroller. The Baby Jogger is a one hand fold, with a pull handle on the seat bottom. It is one of the easiest in the group to fold and it auto-lock and has a carry strap, but it doesn't self-stand. Unfolding is slightly harder and requires two steps to finish. The brakes on this product are single action and work with a single pedal. They are easy to set and release, and they are sandal foot friendly. The storage bin is large and accessible from the front and back. We fit our medium sized diaper bag inside, but you'll have to reach pretty far under the handlebar to find the bin. The bin has a maximum allowable capacity of 10 lbs which is better than some, but not as good as the UPPAbaby strollers with their 25+ lbs limits. The Mini has slim pockets on the back of the toddler seat, but they will also be difficult to access with the seat reclined. You are unlikely to be using the canopy with your car seat on this stroller. While a few of the adapters do not require the canopy to be removed, we didn't find that the canopy can really be used for protection over the carrier like it can on other car seats. The Mini is easy to setup and earned an 8 of 10 in this metric. 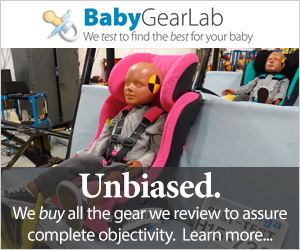 The high in this test is a 10 earned by the UPPAbaby Cruz. It took us about 6 minutes to put this stroller together from unboxing to ready to stroll. The manual is only about average, so it is good that much of the assembly is intuitive. The City Mini is average compared to the competition for quality. The Mini scored about average for quality with a 6 of 10 where the high is an 8. The BOB Revolution and the UPPAbaby Vista Combo both came with high scores. The Mini has a nice sturdy frame. The fabric wraps around the frame well without bunching or pinching. However, the mesh on the sides of the storage bin is loose and snags fairly easily. The wheels are foam filled plastic and are on the smaller side but relatively wide. They are solidly attached and do not wobble. Rubber wheels would have increased its quality score and likely improved the maneuverability as well. The Mini only has shocks on the front wheels. Overall the fit and finish aren't bad, but it doesn't look as sleek as some of the competition. The Baby Jogger has several accessories available for the City Mini, including several car seat adapters for various brands to create a travel system. This multi-model car seat adapter will allow you to connect the award winning Chicco Keyfit 30 and Peg Perego Primo Viaggio 4-35 car seats we tested in this review. If you have a Cybex or Maxi-Cosi infant car seat you'd like to par with the City Mini, then this is the adapter for you. This adapter is two side connectors that can remain on the stroller when folded. BOB 2016 Single Infant Car Seat Adapter for Britax & BOB — This adapter works with several infant car seats made by the Britax company which now also owns the BOB company. This adapter allows the City Mini to be used with the Baby Jogger brand infant car seat the Baby Jogger City GO. The car seat will not work without this adapter. Baby Jogger Parent Console — This console is a nice addition for storing extra items you want to keep close like a mobile phone, wallet, or keys. The console includes two cup holders and pocket with Velcro closure. The console attaches to the handlebar/frame of the stroller with Velcro and can be easily removed. Baby Jogger makes several other strollers. We reviewed the Baby Jogger City Mini GT and Baby Jogger City Select in our Full-Size Stroller Review. We also tested the City Mini GT in this review and it earned 3 points more than the City mini overall. Amazon $181.99 - 30% off!